Free Solo Review | A spectacle, but undoubtedly a thoughtful one. "Honnold is a free soloist, performing alone without ropes or harnesses or protective equipment." "From the many interviews with fellow climbers, we understand that El Capitan is such a difficult endeavour that to think of climbing without ropes is absurd." How small a thought, the philosopher Ludwig Wittgenstein once mused, it takes to fill a whole life. Many of those thoughts hold meaning known only to the individual that formulates them, ostensibly worthless to millions of others. Film fills much of my life, hiking occupies a significant portion of it too, both meaningless in the eye of the inappropriate beholder. 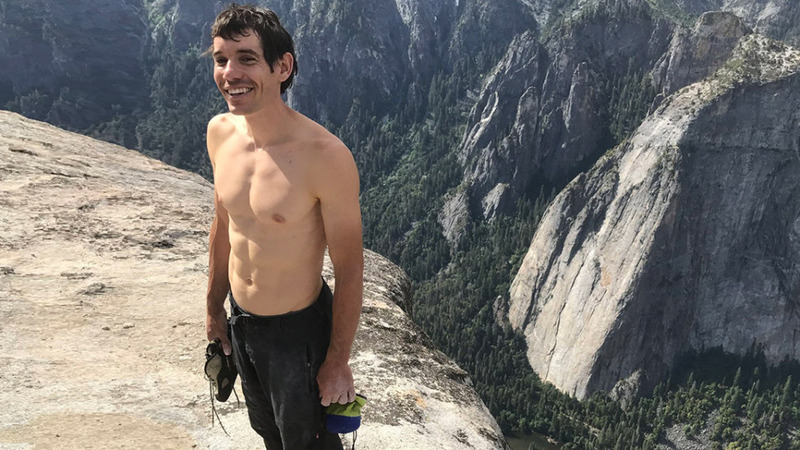 Professional rock climber Alex Honnold fills his life with a small thought, a meaningless pursuit, with more ardour and energy than I dedicate to either film or hiking. His passion brings about the likelihood of death. I’ve never feared for my life while watching a movie. 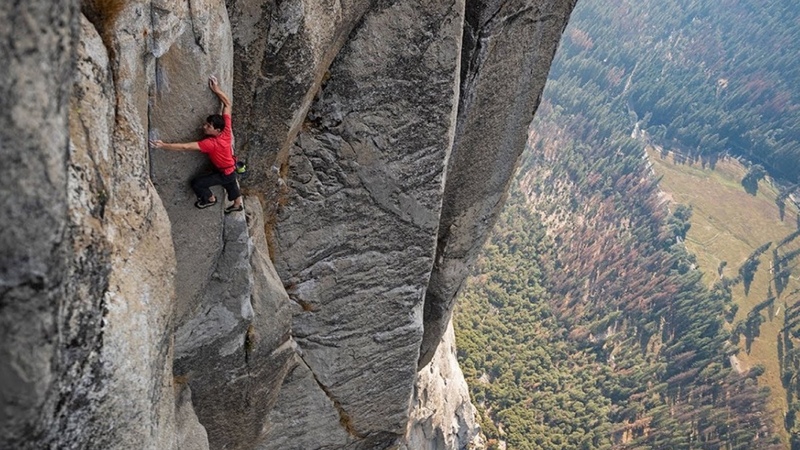 Honnold is a free soloist, performing alone without ropes or harnesses or protective equipment. He relies entirely on his own ability. The assurance and calm one must require when scaling the sort of cliff faces that Honnold is most interested in belong to a precinct of assurance and calm that I know nothing about. Honnald was already a rock climbing celebrity before attempting a free solo climb of El Capitan, the iconic vertical rock formation in Yosemite National Park that you may recognise from your computer wallpaper though we get the impression that fame is a means to an end for someone like him. From the many interviews with fellow climbers, we understand that El Capitan is such a difficult endeavour that to think of climbing without ropes is absurd. Holland is the first to try. Tommy Caldwell, who made his own El Capitan history with his 2015 climb of the Dawn Wall, the rock’s most dangerous route, compares Honnald’s intentions to the first time man walked on the moon. Free Solo, directed by Elizabeth Chai Vasarhelyi and Jimmy Chin, never compellingly demonstrates this. We are never entirely privy to exactly why El Capitan is so feared, beyond the simple fact that all sheer cliff faces ought to be feared in the game of ascension. The climbers know it, the difference between El Capitan and the other cliffs we are shown (one climber telling us that he can comprehend climbing all of the other rock formations in the area, an area that includes the equally formidable-looking Hand Dome, except El Capitan), but the film never wholly conveys it. Without delving into details, certain assumptions can be made about the film and about Honnald’s undertaking. Yet the enormity of what he is attempting is such that out own emotional response as audience members wholly disregards those assumptions. This is a spectacle and it is a powerful one. We may not understand why El Capitan is particularly daunting, nor can many of us empathise with the feeling such a climb engenders but the image of a man dangling by his fingertips halfway up a colossal cliff face will undoubtedly not be lost on you. Free Solo is the story of a man who free solo climbs El Capitan, but it is also an exploitation of human nature and what drives each person out there to do what they do. Why do we follow some small thoughts and not others? What determines how doggedly we pursue them? Early in the film, we are introduced to Sanni McCandless, Honnald’s new girlfriend. She is warm, kind, understanding and loves hugs. Honnald tells us that he had to teach himself to hug after he noticed, in his twenties, that everybody else seemed to be enjoying it so much. He struggles with the ‘L’ word, but expresses love to McCandless through action. There’s nonetheless a degree of emotional disunion. When she implores him to understand why she wants him to live, his general response is that he understands her concern but it won’t stop him from entering into a free solo climb that will likely kill him. Without McCandless, the film would have unquestionably remained an impressive spectacle, but her presence contributes a contrast in personality that is critical to conveying Honnald’s exceptional character. It is neither machismo nor fame that drives Honnald up El Capitan but perhaps rather a placidity of mind that we all seek and few of us are lucky enough to find. At one point in the film, he pauses over a questionnaire at a doctor’s office. Is he depressed? He umms. Free Solo is a more thoughtful film than it initially appears. It may not have answers, but it has suggestions.